Located near Nishiki Market—the “kitchen of Kyoto” and the most bustling part of the city—sits Jiki Miyazawa. At this restaurant, diners can enjoy Kyoto kaiseki (Traditional Japanese course dinner) dedicated to drawing out the natural flavors of the ingredients. The cuisine at Jiki Miyazawa is prepared under the foundation of simple Kyoto style kaiseki cooking. One of the distinctive characteristics of this restaurant are the dishes, which appear simple at first glance, but reveal an elaborately layered and painstaking dedication to quality when you bite into them. Each dish is prepared through an extremely detailed process in order to bring out the absolutely best of the ingredients’ natural flavors. For example, the famous “Fried Sesame Tofu.” This is a very simple dish, consisting of fried sesame tofu, a sauce prepared using only salt and honey, and sprinkled with plenty of roasted sesame seeds. But one taste will flip any impressions you may have about this plain-looking dish. The instant you bring a morsel to your mouth, the fragrance of sesame spreads like an explosion, then slightly thereafter arrives the mild sweetness of the sauce—devotedly prepared with non-additive ingredients—and the buttery texture of the painstakingly crafted sesame tofu. This trio of sensations—a powerful first impact, and then a harmony of flavor and fragrance, with a subsequently gentle aftertaste—combine to form a richly satisfying dish which draws upon every aspect of the flavor filled ingredients. In addition, one can sense the particular creative choices that are in play, such as the use of antique dishware and tableware made by modern artists for the standard dishes. And what’s more, the superb quality of Jiki Miyazawa is reflected not only in its food, but in its customer service as well. Upon being seated at the immaculate minimalist wood counter, a wait staff will arrive to face you directly and bow their head in greeting. As each dish is brought out, it will also be accompanied by a detailed explanation of the ingredients and preparation method. Such a heartfelt show of “omotenashi” (hospitality)! We hope you will enjoy a wonderful meal at Jiki Miyazawa, where each flavorful dish is presented and prepared as an integral part of the restaurant itself. Chirimen fried in white miso. This delicacy will appear at the end of your course, together with freshly cooked rice. Faintly sweet and faintly spicy, this Tsubo miso chirimen has an exquisite flavor, and goes incredible over steaming hot rice. The fragrance of green Japanese peppercorns will waft through your nostrils with a cool elegance. After enjoying this meal, you’ll be thankful from the bottom of your heart, so we highly recommend taking a visit. The price of the course meals changes depending on the season and day. As there is no actual menu, if you are in doubt, you should ask when making your reservation. When your meals are brought to you, you can have the dishes explained in English. 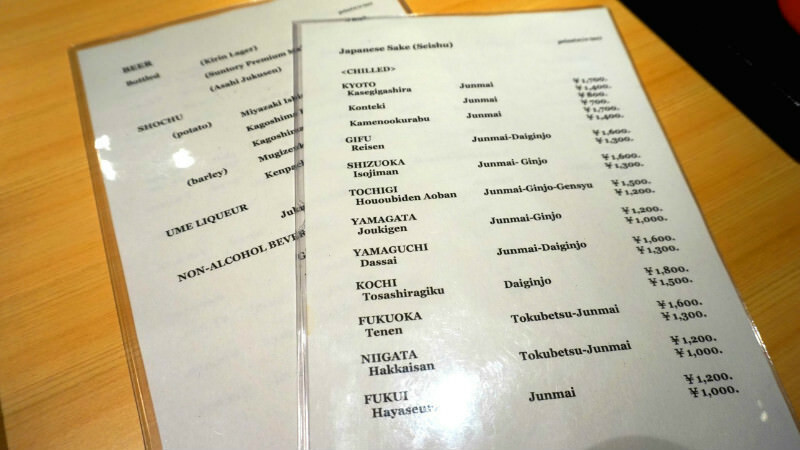 Drink menus are also available in English. The owner, Izumi-san, can converse in simple English. If you require English drink menus, or have any questions about the meal, please inquire at the counter. Of course the food is delicious, but at each moment I could feel the heartfelt touch of “omotenashi.” I really love the atmosphere of this restaurant. The staff positioned in front of the counter space waste no movement, and do not speak unnecessarily. And since they do not use stainless steel bowls or pans you don’t hear the annoying clatter of metal. There is a dignified and appropriate level of tension in the air, and yet the gentle demeanor of the staff helps to create a calm and relaxed environment. Highly recommended for those times when you want to unwind after the tiring confusion of a hectic day. Jiki Miyazawa, winner of 1-Star in the Michelin Kansai edition. This is a very popular restaurant in Kyoto, made famous via high ratings and word of mouth from travel sites in Japan and abroad, and always thriving with customers, whether local or foreign. Whether it’s the cuisine, the atmosphere, service and hospitality, each element is highly refined, and creates a most comfortable environment to spend your time. As it is very popular, reservations are a must. And as lunch service is available as well, we definitely urge you to make some time in your schedule for a visit. From Kyoto Station, take the subway Karasuma line to Shijo Station (approx. 5 min). and leave the station by South Exit 6. If coming by Hankyu Railway, get off at Hankyu Karasuma Station (West Exit 14). We definitely urge you to make reservations. When making a reservation, we recommend going through a hotel concierge. Also, customers may not be accompanied by small children. The owner Izumi-san can converse in simple English, and will explain the dishes for you. Families and couples from overseas are frequent, and the staff is somewhat familiar with serving foreign customers.